NOHspace is the perfect intimate venue for your next showing, performance, or meeting. Our doors are open to artists, theatre companies, educators, presenters, start-ups, and companies to use. This charming space is suitable for performances, special events, workshops, rehearsals, film shoots, meetings, presentations, screenings, and more. 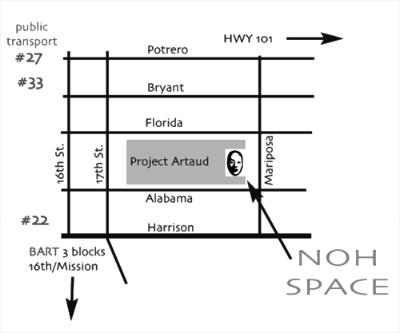 NOHspace is now considered a central creative hub, located in the historic Project Artaud, in the heart of San Francisco's Mission & Noe Valley District. Check our rental calendar, on the right, to see if NOHSpace is available for your next event! Complete the Rental Inquiry Form to make any rental inquiries or to apply for a rental today! For more information, please email: rentals@theatreofyugen.org or telephone 415-621-0507. What type of event is your event?